Some states require that the trailer be titled and licensed, others do not. All necessary paperwork to obtain a title and license plates are included with your trailer. 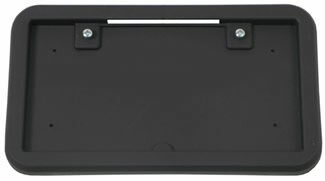 If your state requires a title and / or that license plates be displayed we are offering these accessories. (7) Ft.Wire And (7) Torx Screws! Overloading circuit can cause fires. Do not exceed lower of towing manufacturer rating or: Max. stop/turn light: 1 per side (2.1 amps), Max. tail lights: (7.5 amps). Read vehicle's owners manual and instruction sheet for additional information. Return to our site to see motorcycle cargo trailers, pull behind motorcycle trailers, and tow behind motorcycle trailers.